Burcot Grange Residential Care Home once again extended its renowned hospitality to the wider community with a special Ladies’ Luncheon attended by 40 guests including local councillors, representatives of Age Concern, daughters and friends of residents. As well as providing an opportunity for residents to socialise with friends, the event raised money for Acorns Children’s Hospice, contributing to a total of £1,285 raised by Burcot Grange this year. 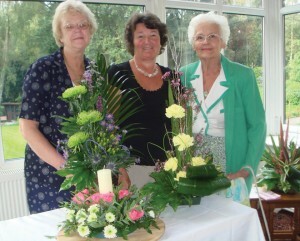 Some 38 residents and guests enjoyed a seasonal lunch, and special guest Valerie Roberts also gave a flower arranging demonstration. Later, the ladies were served a traditional afternoon tea, soaking up some sunshine on the terrace overlooking the grounds. Pictured: Sybil Winmill, Valerie Roberts and Simone Hughes.